To understand the full significance of the first-gen Camaro Z28, you need to put it into context. So let’s start at the start. 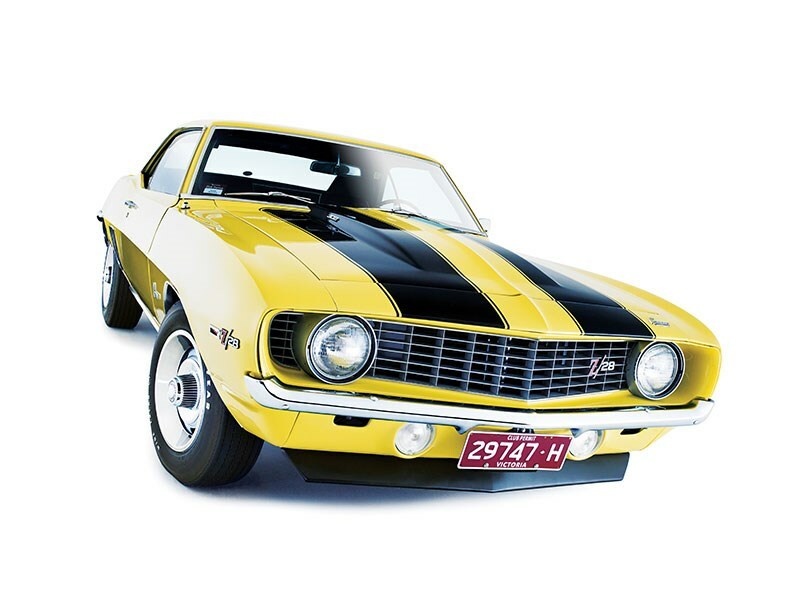 The first-gen Camaro was Chevrolet’s riposte to Ford’s Mustang and the sales success that the original pony-car quickly gathered. While Chevrolet already had the Corvair as a sporty coupe kind of deal, by the time Ralph Nader (author of Unsafe At Any Speed, the book that tipped an absolute bucket on the Corvair specifically and Detroit generally) had finished with the shovel, the Corvair was dead in the water. So, for the 1967 model year, GM got serious about a Mustang competitor and the original Camaro was the result. Like the Mustang, it was available in a range of pretty pedestrian formats, including with a six-cylinder engine and four-wheel drum brakes. But, naturally, the Camaro everybody really wanted was a small-block with Rallye wheels and maybe even the covered RS headlights. Make mine bright orange. No, Butternut Yellow. Of course, these were the days before Detroit clamped down on factory-backed racers and there was constant pressure from within General Motors (and Ford, and Chrysler too) to build race-winning cars that would translate to showroom-stoppers every Monday. And that, in a nutshell, is how the Camaro Z28 package came to be. 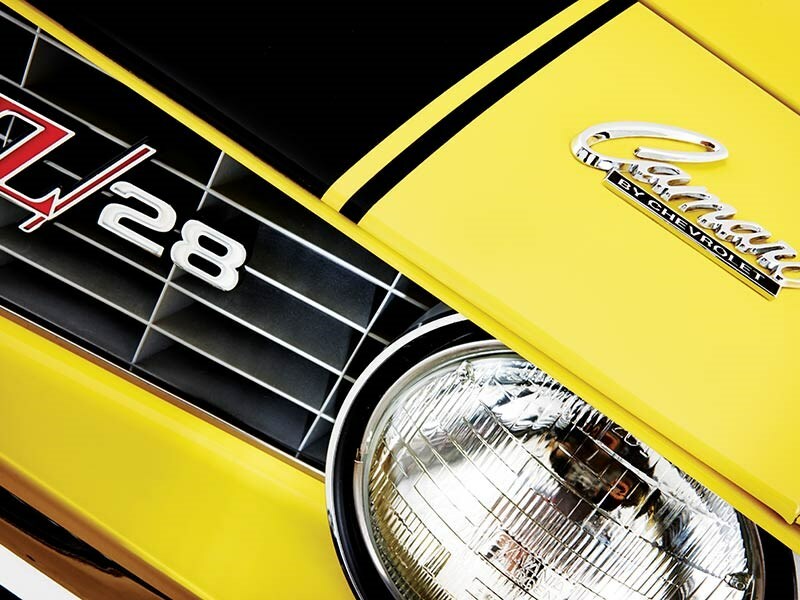 Just like the Mustang Boss 302 and the Dodge Challenger T/A, the Z28 was designed to make the Camaro platform a winner in the very first years of the Sports Car Club of America’s popular Trans American (Trans Am) Series, at the time seen as a vital part of the sales and marketing puzzle. 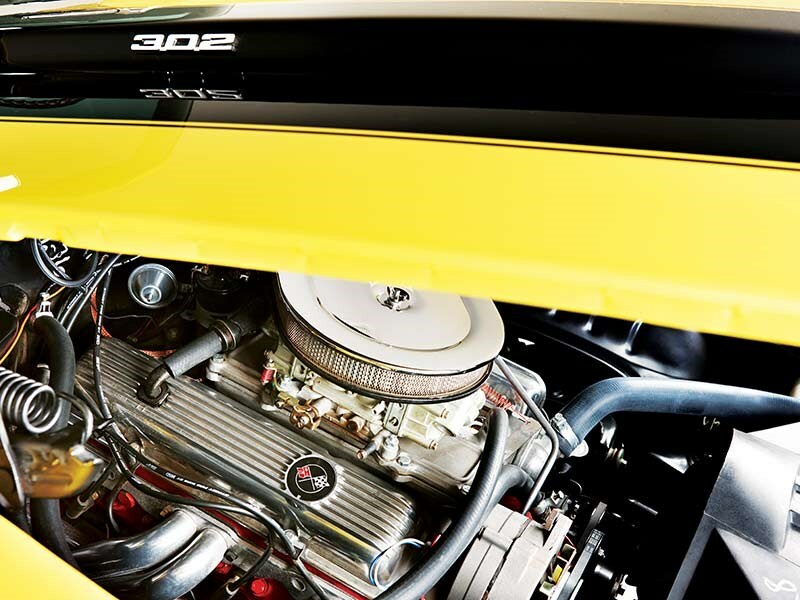 Job One was to give the Camaro Z28 a big-enough heart to run the ball back up the field to the likes of the Boss 302 and Co. With a five-litre upper capacity limit, Chevrolet took a 327 and de-stroked it to arrive at 302 cubic-inches; just under the 5000cc limit. Obviously, with such a relatively small-capacity engine (small for North America, anyway) being able to rev the thing hard was key to making horsepower and winning races. So a forged steel crank went in, along with con-rods made from the same stuff and a set of forged pistons with enough crown to make 11:1 compression. Topping it off was a Holley 850cfm four-barrel which sounds absurdly huge for a five-litre engine. But if you think that’s extreme, wait till you read about the inlet side of the actual car on these pages. Chevrolet rather coyly rated the engine at 290 horsepower, but the reality was almost certainly closer to 400. Bless the insurance companies, eh? Cowl induction (which opened a hood vent at anything more than 80 per cent throttle to draw in cool air from outside the engine bay) was a $79 addition to the Z28’s $458 option price. 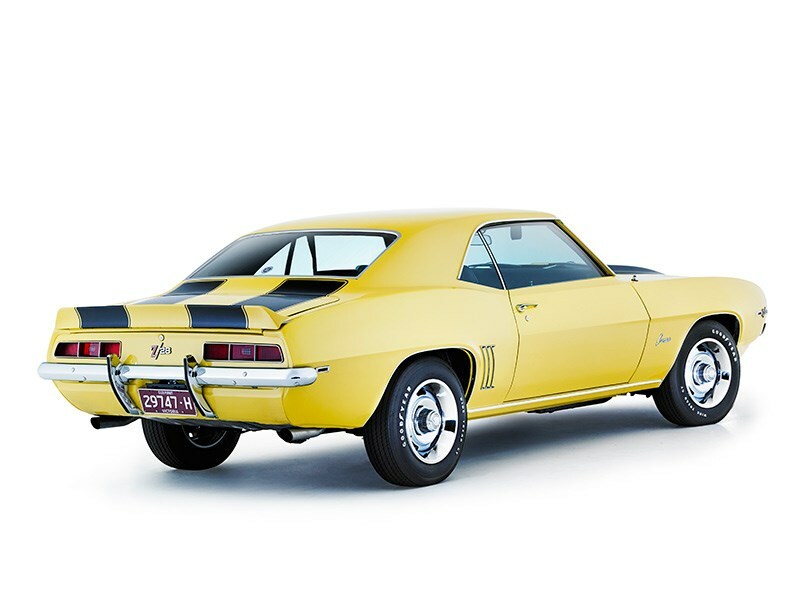 You could also option up four-wheel discs, but at $500.30, they were more costly than the whole Z28 deal and only about 206 cars - and around half of those were race-cars - were factory-fitted with the better brakes. 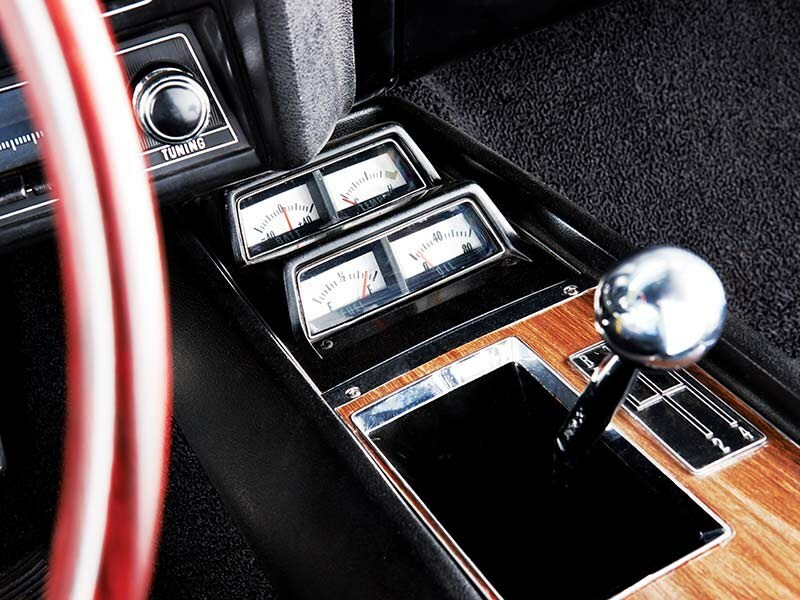 Other Z28-specific items were a quicker-ratio steering box, a Muncie four-speed with (for 1969) a standard Hurst shifter and a 12-bolt rear end with 3.73:1 gears. Oh, and black or white stripes running front-to-back over the whole car. 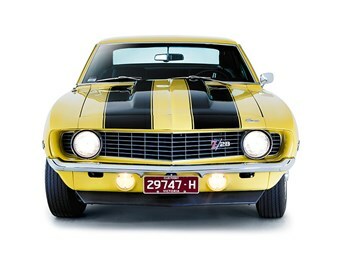 Back then, with Camaro production running at almost a quarter-of-a-million units for the extended 1969 model year (production problems delayed the launch of the 1970 model) as many as 20,302 cars were optioned up to Z28 specification. Which brings us to this car and the rare but delicious option it carries. For the Z28’s first year of Trans Am competition, the rules stated that a single four-barrel was as much carburettor as you could throw at it. But for 1968, the rules changed to allow for "not more than two four barrels". You can imagine a race engineer’s response to that gem. In fact, the rule change is thought to have been pushed by the manufacturers themselves who were looking to spice things up in Trans Am. 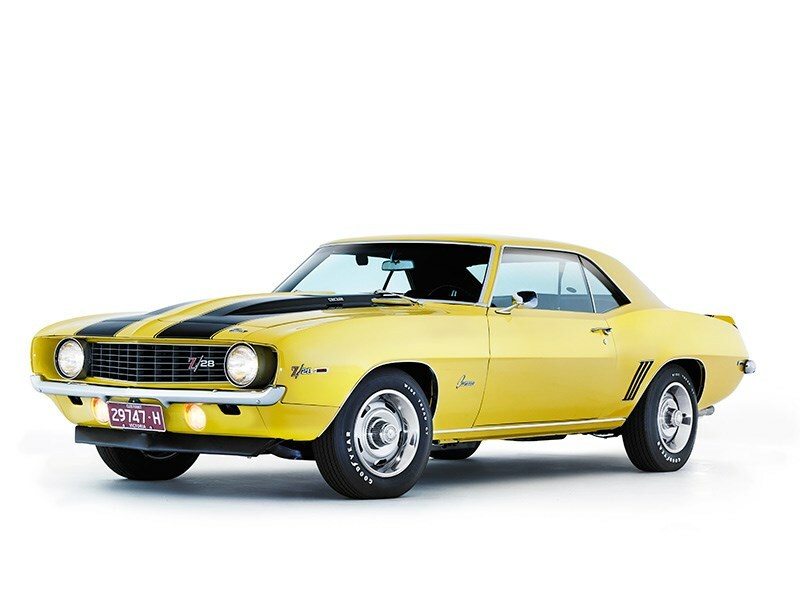 Instead of fitting the multiple carb set-up as part of the basic Z28 package, it was offered as a dealer-fitted option (or over the counter at your friendly Chevy dealer) as part of Chevrolet’s ‘Heavy Duty Service’ parts program (read: Motor Sport Program). But what was it? Well, it was called Crossram and in order to boost the 302’s breathing abilities and stay within the rules that called for the entire engine to be contained under the stock bonnet (for safety) Chevy elected to mount twin 600cfm Holleys on a two-piece cast-aluminium manifold that placed the carbs diagonally-opposite each other, offset from the engine’s centreline. 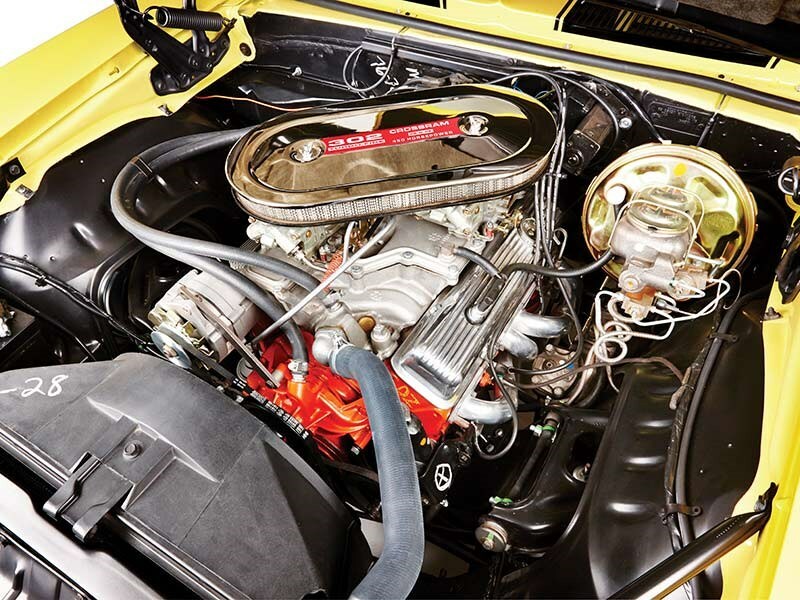 With a single plenum arrangement, the manifold allowed for long runners that produced a `ram’ effect to cram more air and fuel into the cylinders, especially in the context of a high-revving engine with an angry camshaft profile. Backing up the system’s race-car credentials is the fact that no provision existed for either manifold heating or carby chokes. But you can forgive it that when you discover that with just five litres to work with, the package managed to crank out better than 450 horsepower at 7200rpm. And race results? Stellar, frankly. 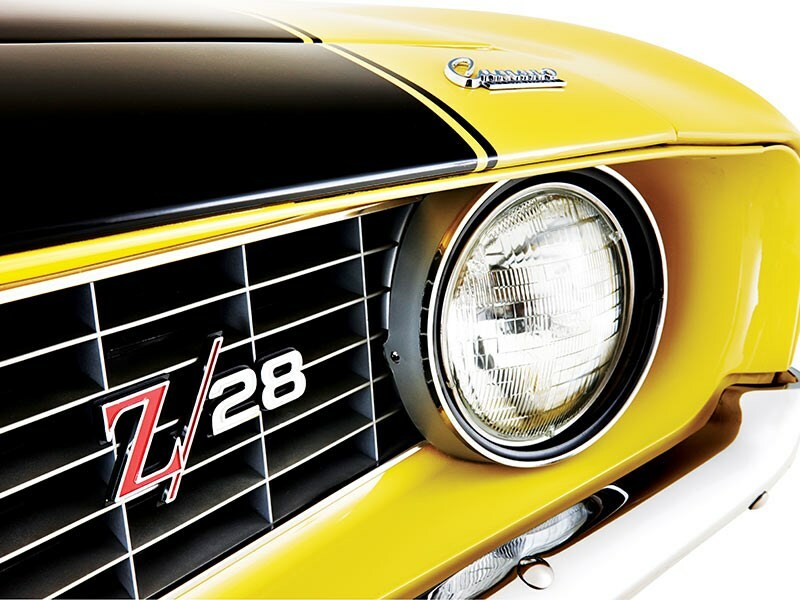 In 1968 and ‘69, the Z28 took out the Trans Am title, completely fulfilling the car’s original design brief. Strangely enough, in those days the Trans Am championship was for manufacturers, and a driver’s championship wasn’t initiated until 1972. But those winning Z28s were campaigned by Penske Racing with Chevrolet factory money and Mark Donohue himself at the helm. In fact, such was the Z28s dominance in 1969 that Donohue won six of the last seven races of the series. Okay, so the Crossram idea wasn’t new; Chrysler had already tried it with great success, but as a $500 option back in the day, it was right up there in terms of desirability and rarity. Nobody really seems to know how many Crossram-equipped Z28s escaped showrooms in 1969, but the smart money suggests only about 250 out of those 20,000-odd Z28s, so to find one in stock condition with all the Crossram hardware in place as late as 2012 is a pretty amazing feat. But that’s exactly what happened in the case of this car. What was more or less a bunch of matching-numbered parts just two years ago, is now the stunning vision you see here in Daytona Yellow with black stripes. Aside from the things that make each and every first-gen Camaro special and every Z28 even more special, this one is a dinky-di, original, honest-to-goodness Crossram car. Triple-special.